There are lies that don’t matter much, but then there are lies that matter a whole lot. This lie matters a whole lot: Kim Johnson has been spinning a web of lies about her “independent” campaign. Why? She doesn’t want to be associated with WNW — but she’s been working with them for months. After months of meetings, about 12 Jeffco conservative education leaders have selected a candidate for the Jeffco school board, to represent District 3 (Arvada). Five prospective candidates participated in an extensive vetting process that included weekly meetings for five months and mock interviews, speeches, and responses. These people were grilled! Following this extensive vetting process, the team selected Kim Johnson. We don’t buy it. And we especially don’t buy it because Johnson filed her campaign with the Colorado Secretary of State on June 19 — a mere 10 days before Mund sent her email stating that Johnson had been selected after a five-month vetting process. If Johnson knew she wanted to run as an “independent candidate,” why did she wait until she had the approval of the GOP selection committee? She could have announced her candidacy months earlier — but she didn’t. Preston Branaugh, Brett A. Moore, Rachel Swalley, Dan Green, David Brazzell, Jim Powers and Mary Everson. The connections among the group involved in selecting Johnson run deep. Several of them ran for open seats on the Board of Education in 2011 or have been appointed to serve on district committees by WNW. No, ma’m. At this point, probably the worst lie you could tell when running for school board in Jeffco is to say that you’re independent when in fact you’re collaborating with WNW’s team. Hiding your intentions, again. We fell for it in 2013, but we won’t fall for it this time, Kim Johnson! This is why JCSBW has been starting to use the term WNW + Johnson + Merritts. If leaked memos aren’t convincing enough, consider that Johnson and Merritts both recently had ads in Atwell’s WNW/Koch mouthpiece (and newspaper wannabe) The Observer, and both candidates’ yard signs are appearing together. Jeffco Students First is also endorsing both of them. The email string about Tori Merritts’ selection process just hasn’t been leaked yet. Jeffco voters will start receiving their ballots this week. When you receive yours, please vote! Every vote counts, and we need yours. Last week, we put forth a poll asking you to select the Top 10 most disturbing stories out of the 30 that we selected from the current Jeffco School Board majority’s tenure. Note that if we had run the poll this week, we certainly would have included Witt’s bizarre and appalling press conference that even his media allies can’t restrain themselves from criticizing and joking about. Safe to say that his presser will be on everyone’s mind for a while. What Happened: To summarize what we posted a few weeks ago, in 2013, WNW sent approximately 6 mailers out across much of Jefferson County. Jeffco Students First also sent out “The Jeffco Observer.” According to multiple professional estimates, the mailers alone would have cost *at least* $200,000 dollars for design, printing, and postage. The Observer, designed largely to support WNW, cost a lot too. These communications were paid for by sources outside of their official campaign reporting, by third-party organizations that were nonetheless formed specifically to aid WNW. This is what’s often called “dark money.” WNW’s campaigns also raised some money. Clear as day on mailers was “Americans for Prosperity”: The Koch Brothers’ political advertising and activism machine. As for other donors? It appears that WNW’s biggest fundraiser took place in Arapahoe County, and the guest list was packed with wealthy donors from outside of Jeffco. Meanwhile, Tonya Aultman-Bettridge, Jeff Lamontagne, and Gordon “Spud” van de Water each raised in the $35,000-$60,000 range for their official campaigns. Those numbers were indeed higher than the “official” reporting for WNW’s campaigns, but A LOT LESS than the money that was spent on all of the mailers via the “dark money.” Why is that “dark money?” Because most or all of it came from the Koch Brothers/Americans for Prosperity, or the other wealthy donors from outside Jeffco, and THEY DON’T WANT YOU TO UNDERSTAND THAT. It’s like comparing two families’ spending on food for a month, and saying that one spends a lot more after just comparing their grocery bills, neglecting the fact that the other family that’s spending less on groceries is only doing so because someone is paying for them to eat out at restaurants all the time. In the end, which family spent more? It’s simple: WNW easily outspent their opponents in 2013. In their usual sneaky tactics, WNW’s allies are just looking only at the official campaign contributions in order to convince you that they were outspent, to further the idea that their elections were driven by a “grassroots” effort. That’s both laughable and sad. As you can see, WNW really weren’t outspent, and that’s a major reason we’re in this mess. Why It Matters: We think that everyone intuitively understands why this matters. Political research indicates that more than 90% of elections are decided by those who spend more money. Of course, some of that is because the candidates have real grassroots support among the people that know them, but the Kochs and others wouldn’t be doing this unless they knew that it was usually successful. In local elections, although people joke about putting mailers straight in the trash, they do work because they’re often the only exposure many busy voters have to candidates. Send a good mailer, get a vote. The juxtaposition is shocking. Not that long ago, winning school board candidates in Jeffco commonly raised $10,000 – $20,000 for some yard signs and brochures, and perhaps a mailer to a cross-section of voters. The sudden transformation from the $10,000 range to $1,000,000+ should cause anyone alarm. That kind of jump in spending, especially on a nonpartisan election, should raise huge red flags about the political nature of the fight. It should also raise your hackles. It is a disturbing trend that anyone can spend unlimited amounts, mostly hidden, wherever there want, on any local race in the country. Somehow it seems even more painful in Jeffco. Maybe that’s because we’re from Jeffco, and we pride ourselves in the rich history of independence and spirited debate among locals here. This is Colorado; this is Jeffco; we are independent and don’t take well to outsiders with an agenda trying to buy elections and supporting candidates that they don’t even know. It also matters because it looks as if they’re on an even bigger spending spree to support WNW in 2015. Look for “Americans for Prosperity” on that TV ad, door hanger, or mailer…and then vote for Ali Lasell, Amanda Stevens, Brad Rupert, Susan Harmon, and Ron Mitchell, who have vastly more local support in every way. Chances are you’ve already seen the videos from the Sept. 24 board meeting. Colorado Pols said it best: Ken Witt Presents: How to Make the Case for Your Own Recall. Witt, Newkirk and Williams are going for the nuclear option on the new District Accountability Committee (DAC), which was formerly SPAC – the Strategic Planning Advisory Council. They want to wipe it out and start over. Witt, Newkirk and Williams approved a K-6 school instead of the district-recommended K-8 at the Candelas site and then patted themselves on the back. A proposed budget increase for Jeffco security was pushed off for another month, and although WNW seemed to suggest they might vote for it, we also saw hints that another surprise is just waiting in the wings. The first agenda item was a second review of the proposed new DAC bylaws. The usual process is to review the bylaws, ask a few questions, make any additional revisions, and vote. That didn’t happen. Instead, Newkirk revived his nuclear option and offered a lengthy motion detailing the membership of the new DAC. Surprise! He didn’t bother to share it with the full board until around 1 pm that afternoon. Somehow, both Witt and Williams had plenty of time to sit down and read it thoroughly. Dahlkemper and Fellman, meanwhile, had no idea that they should even expect anything new to be added with a board meeting only a few hours away. They told Newkirk they were not ready to vote on an item they had just received that afternoon, and had not had time to review it on account of things like work obligations. But I will tell you – the mistake that you are making right now is that we have a policy on the table about how we govern. You are throwing governance right out the window because you have some agenda that you feel so critical that we have to vote on tonight…that even a simple request that is to say, “Look, our policy says we review it, and then we vote on it.” And don’t you dare insinuate that I don’t understand this policy. And stop talking down to people on this board, and also people who come forward. Enough. What Witt clearly doesn’t understand — or more likely, could care less about — is that having a discussion in which people toss around ideas, and reviewing a written document are not the same thing. In this case, the board had reviewed a proposal to split the SPAC into two committees: a District Accountability Committee (DAC) and a separate Strategic Planning Advisory Committee. Members, rather than trying to cover two large topics, would focus on accountability measures in the former and strategic planning in the latter. WNW have repeatedly expressed concern that SPAC didn’t adequately conform to state statutes, although even their own board lawyer, Brad Miller, assured them that everything was fine. But then the SPAC members suggested that it would be easier to split the two so each could focus on a separate set of duties. Those volunteers, including the SPAC chair and chair-elect, worked with district staff to write a new set of by-laws. They met with the BOE at the Aug. 27 meeting to get feedback. For the record, those by-laws included a suggested membership. This was also the meeting where Newkirk suggested they clean house, appoint new members and then direct those members to write their bylaws. As we noted, the idea didn’t go anywhere at the time, but resurfaced in Newkirk’s motion. There are several problems with Newkirk’s motion. For starters, how many people would be on the new DAC? Huh? Newkirk specifies 11 members, but also specifies that the committee would include one SAC chair from 17 articulation areas. The math doesn’t add up. + 1 (or more?) parent + 1 business community representative + 1-3 teachers + 17 SAC chairs = 20 – 23 members. Is Newkirk suggesting that the BOE would only appoint 11 members but there would also be more on the committee? Despite his concerns about poor ACT performance (cited in the motion!) did he not realize that 11 ≠ 20? We weren’t the only ones who weren’t clear about what this meant. The motion that was eventually approved also directed staff to solicit applications for review a the Oct. 1 meeting (yes–solicit and receive applications in the space of one week). Staff and board members alike were also confused about how, who, and how many applications they should solicit. We ask, how is it a “compromise” to put off a vote on an ill-conceived proposal that would establish a DAC that did not conform to state laws, despite Witt and Newkirk’s constant “concern” that the current SPAC didn’t conform to those very same laws? That’s irresponsible governance, pure and simple. a. Newkirk is a severe, chronic procrastinator who simply does not get proposals written until the last minute, and that’s why the membership proposal wasn’t shared with Fellman and Dahlkemper (and presumably Witt and Williams) until the afternoon of the board meeting. Also, Williams and Witt just happened to have the afternoon free and were checking for any last-minute additions sometime between 1 and 5 pm. b. Newkirk is a severe, chronic procrastinator but he also notified Witt and Williams that a new, different proposal would be headed their way sometime on Thursday afternoon so they could set aside time to review it. c. Newkirk had written the proposal earlier, shared it with Witt and Williams, and only shared it with Dahlkemper, Fellman and the rest of the public after consulting with Witt and Williams. Options B and C are clear violations of Colorado’s sunshine laws. Option A is not, but, if true, is also is a clear example of how this board is not transparent. Posting a new proposal that varies considerably from the membership outlined in the proposed DAC bylaws only hours before the meeting, and pushing to approve said proposal without any public comment (or time to write the board before the vote) is neither transparent nor respectful. Option A is also the least likely of the three. Too many stars have to align, and we find it curious that two members of the board majority just happened to have checked for last-minute additions and had plenty of time to review them. The vote against district recommendations to build a K-8 school at Candelas wasn’t a surprise but is another example of pennywise but pound-foolish. It’s not clear why WNW pushed for a K-6. One concern they articulated repeatedly was that students from Leyden Rock would be joining an established cohort at Candelas for 7-8, but it’s equally true that at most of our middle schools, cohorts from the surrounding neighborhoods all merge in middle school. If the Candelas students head to Wayne Carle Middle School, they’ll join cohorts from Lukas and Witt Elementary. If the Leyden Rock kids head to Oberon or Bell Middle School, they’ll join cohorts from the elementary schools in those articulation areas. WNW also argued that there was only demand for seats at the K-6 level and not in the middle school level. District staff pointed out that although area middle schools have capacity available now, they won’t by the time these developments reach full-buildout. We’ll need those middle school seats in the not-too-distant future. McMinimee cited the current numbers of sixth-grade students at current, overcrowded NW Arvada schools, but WNW ignored those concerns. A third concern is that it’s much cheaper to build a K-8, even if it will need an addition, that it is to build and maintain a K-6 and separate, future 7-8 building. It’s cheaper to add to a building than it is to construct a new one. One K-8 building is also cheaper because there are less custodial costs and less administrative costs (2 principals vs 1, and so on). Utility costs are also cheaper because you’re only paying for electric and heat in one building. There’s only one gym, one library, one cafeteria, one kitchen, and one set of main offices, as opposed to double of all of that with associated costs. Staff also noted that the Candelas site could accommodate multiple structures. If they built a K-8, there would still be 10 acres available that could support another building. It’s unlikely that will be possible with two separate buildings. What’s the real reason behind a K-6? Is Witt hoping to put a charter school into the new building? We wonder. The other main item was a budget request from Jeffco’s Security and Emergency Management department. Director John McDonald had given a brief presentation on the increased numbers of threats and suicide assessments that his department has seen in the past couple of years. His staff of 11 is at capacity and he needs more staff to keep up with the increasing number of issues. About half of the $1.5 million request is for on-going expenses (additional staff), and the other half is for one-time expenses. Williams asked a number of odd question she said she’d been asked, too. She said people were worried about bringing Child Protective Services into the schools like New York. McDonald said he hadn’t heard of such a thing in Jeffco. She asked if FERPA no longer applied if students had contacts with law enforcement. Answer: FERPA remains in place. Williams wanted to know whether students knew their rights, and whether policies regarding contact and interviews with law enforcement had been made available to the public. Answer: policy JIH and JIH-R, which are available in BoardDocs. Just click the “policies” tab and type JIH. (Capital letters work better, FYI. And so on). Basically, Williams doesn’t appear to have read the Student Code of Conduct in full, and certainly hasn’t bothered to read through all those pesky district policies either. (But she had time to read Newkirk’s last minute proposal!) Note again that she could have asked McDonald these questions two weeks earlier during his presentation, and that they aren’t related to his budget request. The disconnect is odd. Witt asked what the funding was for, despite the fact that McDonald had already provided that information to the board two weeks ago. Apparently the document contained some information that could compromise district security, so it hadn’t been posted to BoardDocs. There are plans to extract the information that can be made public and post that soon. Witt also asked where the money would come from, which to us is the only reasonable question we heard on the topic. The problem is that WNW already allocated all the funding (see $18 million to build a “debt-free” school in NW Arvada), and little discretionary money is left to handle the request. They may be able to borrow money from vacant positions and retirement savings to fund the request this budget year, but money is tight. Fellman asked about pulling half a million from reserves to address immediate needs, but Chief Finance Officer Kathleen Askelson cautioned against it, saying they’re hearing dire news from the state regarding 2016-17 budgets, and that there could possibly even be a recision for the current year. The plan is to revisit the issue at the Oct. 15 meeting. The board seemed to be in favor, but the odd questions from Newkirk and Williams combined with Witt’s statements also make us wonder if they’re taking the request seriously or if we’ll see another Plan B or other nonsense instead. You know the drill: you can donate to the recall campaign and/or to the five candidates we’re endorsing in this election: Amanda Stevens, Ali Lasell, Brad Rupert, Susan Harmon and Ron Mitchell. You can donate to the candidates individually or support all five by donating to Jeffco United Forward. You can write a letter to the editor. You can walk Jeffco to talk to the 70 percent of voters who do not have children in our schools currently to let them know why we support the recall. You can put up a yard sign or wear a button. You can speak at public comment during the Oct. 1 board meeting, or you can boycott the meeting to speak to Jeffco voters instead. You can write to the board. Most importantly, you can vote. This is on the November 3 ballot. Watch for your ballot to arrive in the mail, and be sure to fill it out and return it by November 3. 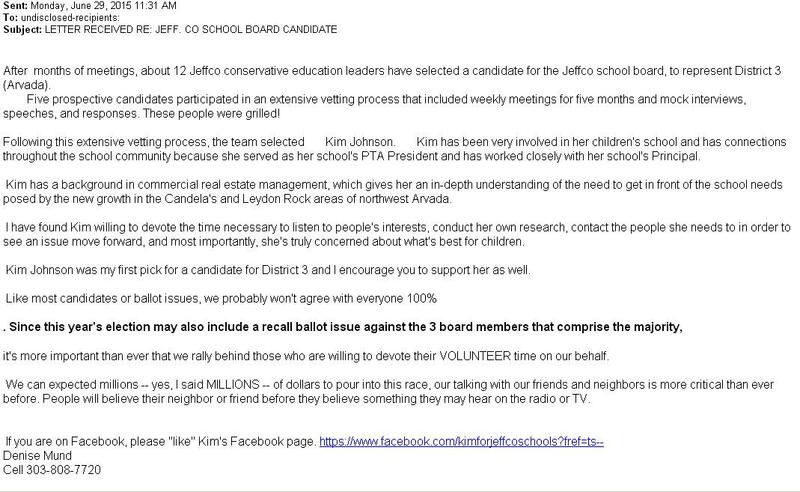 Hopefully you’ve also seen the post about board president Ken Witt telling board member Jill Fellman she would no longer be needed at the district agenda-setting meetings, and that John Newkirk would now attend all of the meetings until the election. If you haven’t seen it, Support Jeffco Kids has that story. JCEA’s membership ratified the agreement, so now it goes to a school board vote. Based on what we’re seeing further north in the Thompson School District, there’s plenty of good reason to suspect that Witt, Newkirk and Williams (WNW for those new to the school board majority shenanigans this year) had no intention of working out a tentative agreement, much less approving one. With the recall mechanisms in motion, however, perhaps they’re more incentivized than usual? There’s a lot to not like (i.e., a ridiculously short 10-month contract and the money that will be spent to negotiate another contract next year). And yet there are some protections for class sizes and other important issues in place–which is always important for a group of ideologues who are convinced that 40 or 45 kids in a classroom is actually an ideal situation for kids. This appears to be more monkeying around with SPAC, the Strategic Planning Advisory Council, who WNW appear to have been targeting since they took office. SPAC has been functioning as the state-mandated district accountability committee and the district’s lawyer and Superintendent McMinimee have confirmed that it meets the law’s requirements. Nevertheless, WNW want that committee under their thumb and this may be another move in that direction. This is one of multiple presentations the board has heard since August 2014 about the growing population in north Jeffco. It’s an issue that primarily affects the northwest Arvada area but is also affecting nearly all the Jeffco Schools north of I-70, as Steve Bell pointed out in one of his presentations last spring–and to which north Jeffco parents can testify. The issue is due to a couple of factors, including the number of new housing developments: Leyden Rock, Candelas, Whisper Creek, and also smaller amounts of construction on what used to be small farms around Arvada, like the area just to the east of Majestic View Park near 72nd and Kipling. A second factor is that Sierra Elementary in Arvada was due for phase 2 of a remodeling and expansion project, but the bond to move that project forward was on the 2008 bond referendum, which failed. Sierra families have brought this issue to the board repeatedly in past years, but WNW have ignored them. Completing phase 2 would add more seats to the area, but there are no plans to do that. The third factor is that two schools in the Arvada/Westminster area were closed in 2012 as the district grappled with budget cuts. One of those now houses the Head Start program–and that will continue because Westminster tore down the building that Head Start had been using (also due to budget cuts which meant a lack of money to do the necessary maintenance and repairs to the aging structure). The other was Zerger Elementary, which remains unused. It has been suggested repeatedly as a possible option to deal with the growing number of students, but Bell said the building was stripped when they closed it down. Reopening Zerger would require replacing not only the usual classroom furniture, but also chalkboards, projectors, and more. The school is also located about six miles away from Candelas, so if the plan was to send children from the area to Zerger, they would have a lengthy bus ride–assuming that parents chose to fork over the $150 for bus service. What we do know: the board set aside $18 million to build a school, and it’s unlikely that WNW will budget from that number no matter what. We’ll try to post a review of the Certificates of Participation and construction costs issue in the district in the next couple of weeks. Last spring, a Jeffco family brought a number of issues regarding Montessori Peaks to the attention of the board. This item revisits the district’s investigation into the matter. The meeting starts at 5:30 pm in the board room on the 5th floor of the Education Building (1829 Denver West Drive, Bldg. 27, Golden, CO). If you can’t be there tonight, please join us virtually on the live stream.